THE TITLES of Diane Arbus’s photographs read like short stories. There are tall tales (“The Man Who Swallows Razor Blades”), elegiac utterances (“Windblown Headline on a Dark Pavement”) and statements that hint at her fascination with the way the real and the fictive can be brought together in a single frame (“James Dean in a Wax Museum”). As Jeff Rosenheim, the curator of a new show of Arbus’s work at the Hayward Gallery in London, points out, her predecessors and contemporaries captioned their photographs less descriptively. 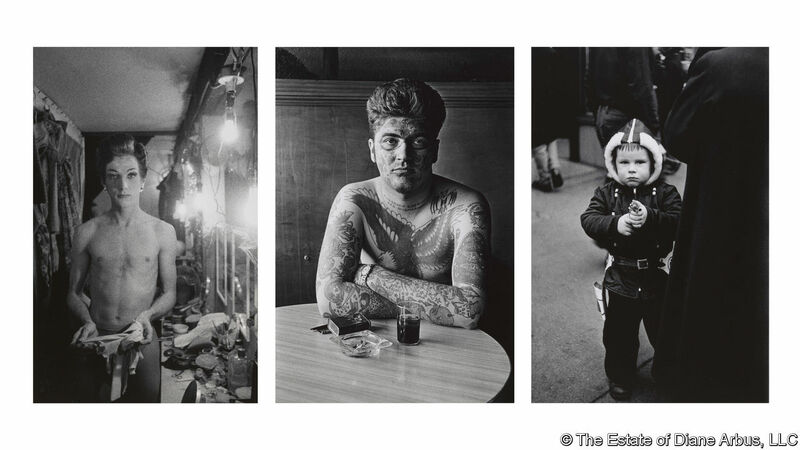 Those artists—such as Robert Frank, Garry Winogrand and Helen Levitt—usually referred to the place they were taken, and rarely mentioned the content in great detail. But Arbus was different, with titles so vivid and poetic the photographs themselves hardly needed to be seen. Arbus’s words are testament to the care with which she composed her photographs, and the sensitivity with which she approached her subjects. She captured what many viewed as the “freaks” of her time—or, as Susan Sontag classified them, “assorted monsters and border-line cases”. Arbus’s most famous set of images, “A Box of Ten Photographs” (1971), show a young boy with gigantism towering over his parents; identical twins; an elderly couple at a nudist camp; a young man at a pro-war march; the king and queen, who have never met before, of a senior citizens’ dance. Other works feature human pincushions, contortionists, a young boy clutching a toy hand grenade and people with tattoos covering every inch of their skin. All of these figures look out of the frame at the viewer, captured at the precise moment they see Arbus’s lens. Photographers usually took a more sly and surreptitious approach to street photography. Paul Strand distracted his subjects with a fake lens on his camera; Walker Evans snuck shots of subway passengers from a camera he concealed in his coat. Arbus did not hide in this way. She did not rush or steal quick glances, she approached her subjects directly, sometimes building ongoing relationships with them. Usually centred in the frame, the people she documented seem to rise up out of their surroundings. Arbus’s work was only exhibited in a few museums during her lifetime and when it was, it polarised opinion. Many praised the beauty of her compositions and her inclusive approach to human identity but others, such as Sontag, condemned her work as “anti-humanist” and exploitative. In 1965, when some of Arbus’s photographs were shown at the Museum of Modern Art in New York, a gallery worker used to wipe the saliva off the pictures each morning—viewers had spat at them the day before in disgust. “Her work shows people who are pathetic, pitiable, as well as repulsive, but it does not arouse any compassionate feelings,” Sontag thought. The show at the Hayward does not come down on one side or the other, or even address this question explicitly. Instead, it asks the viewer to reflect on the role they play in looking at the people in Arbus’s photographs. Made up of around 100 works from the first seven years of Arbus’s career, two-thirds of which have never been seen before in Britain, “in the beginning” forces visitors to navigate their way through a warren of pictures, making their own decisions about where they look and when. There is no meaningful beginning or end, and no logic to the order. One small space displays the “box of ten”, her famous square-shaped shots, but the bulk of the work is presented in two main rooms where the photographs are affixed to the corners of tall grey pillars arranged in a grid. Visitors will decide for themselves whether Arbus’s practice was voyeuristic or not. But it seems that people wanted to tell her their stories, and “in the beginning” is a deafening chorus of tales about many types of human experience. At times overwhelming, often beautiful, it is a chance to see the world as Arbus did, and to share a glimpse into the lives of others.